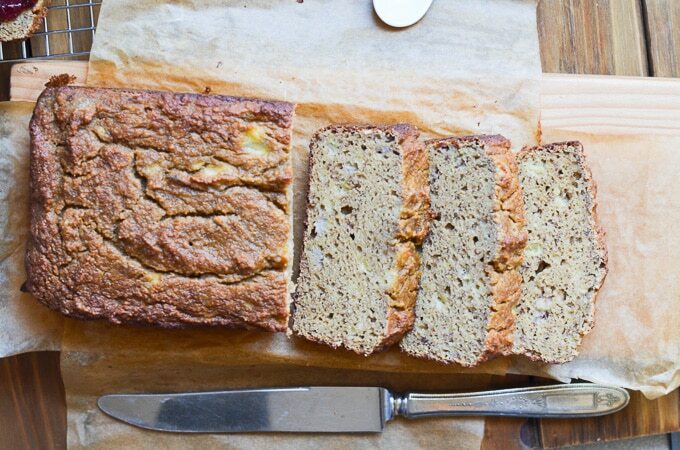 Coconut flour banana bread with the perfect texture that is also grain, gluten, and dairy-free (Paleo)! This nut-free version of a favorite classic will become your go-to! Warning: make this and as the aroma fills your house, they’ll come running, so make sure you get a slice for yourself. Freezes beautifully, and such a wonderful treat for those looking for nut-free banana bread that is refined sugar-free! I’ve made this bread with several different brands of coconut flour and had success each time. It’s so easy to throw together and such a delicious treat! Step 1: Gather and measure the ingredients. Mash the bananas in a bowl. Step 2: To an electric mixer, add the eggs, vanilla, maple syrup, coconut sugar, and coconut oil and beat for about two minutes until combined. Step 3: To a mixing bowl, add the coconut flour, tapioca flour/starch, baking powder (gluten-free), ground cinnamon, and salt. Whisk to combine and remove all lumps. Step 4: Add the coconut flour mixture to the egg mixture and beat for a minute or two until combined (see photos). Step 5: Add the banana mash and beat for about 30 seconds until combined. Step 6: To a loaf pan (here’s the one I use and love), spray with coconut oil, and then line with parchment paper (easiest cleanup ever!). Step 7: Pour batter into the pan and bake at 350 for about 40 minutes until toothpick comes out clean. Let cool for about 10 minutes to slice. Let cool for about ten minutes before slicing. I added a few slices of banana on top as a decoration, plus delicious too! Use ripe bananas (maybe a few black spots) with no green if possible. Your bread will be sweeter. Let cool for 10+ minutes before slicing. Only uses a teaspoon of coconut oil, but could probably omit if looking for oil-free. Toss in a few tablespoons of dairy-free mini chocolate chips or chopped walnuts for an extra treat. The eggs are necessary because coconut flour needs moisture and do not believe flax or chia eggs would work in this recipe. Do not substitute the coconut flour for another gluten-free flour (like almond). For gluten-free baking powder, try this recipe. 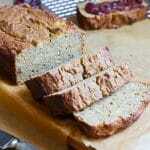 Does the coconut flour banana bread taste eggy? No, since I used only 4 eggs, this bread does not have a pronounced egg flavor. Is this bread freezer friendly? Yes! How to determine the banana bread is baked through? The top will be browned and a toothpick will come out clean. Can I omit the eggs? I have not tried this and do not believe it would work due to the properties of coconut flour. How do I store this banana bread? Store in an airtight container, or plastic wrap. How long does this banana bread last? It’s best consumed the day you make it, however, store in the refrigerator for a day or two. p.s. I love to see what you’re making! Post a photo and tag me on Instagram @24carrotkitchen! 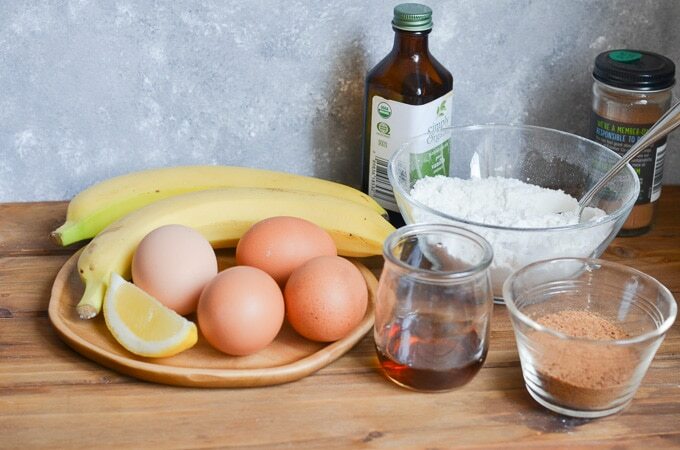 Great for breakfast, as a snack, to take along on a trip, you’ll love this nut-free coconut flour banana bread! 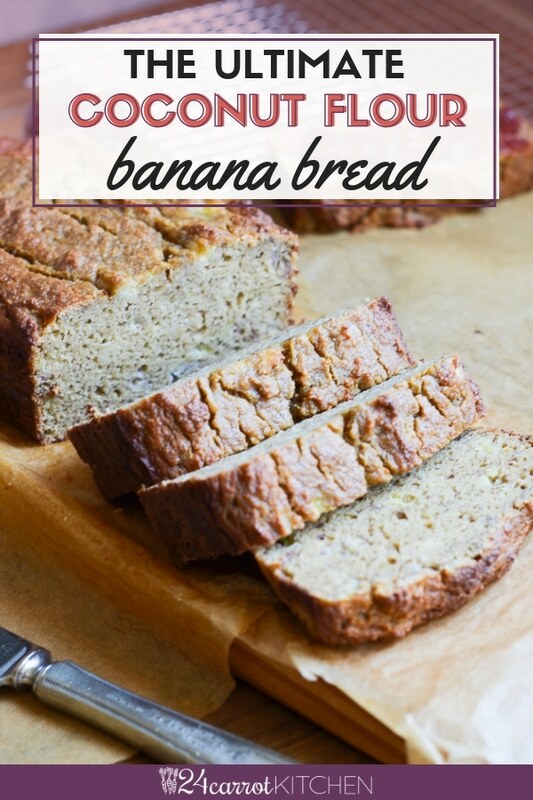 Amazing Coconut Flour Banana Bread (Paleo)! 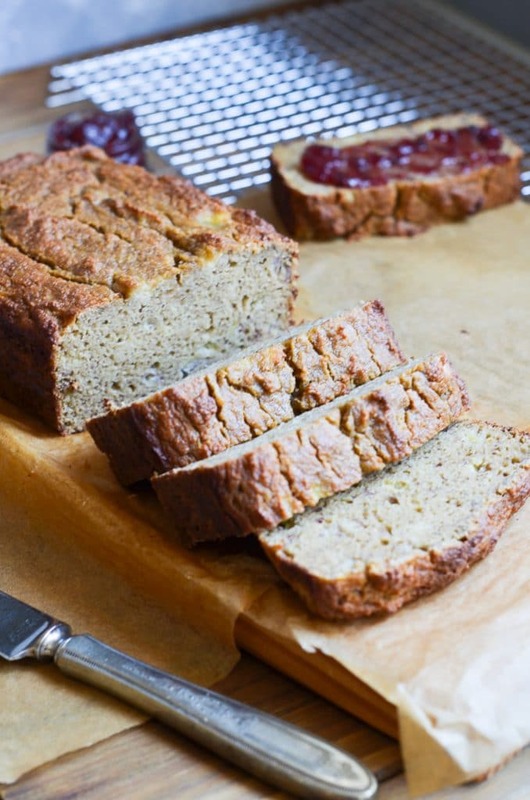 Coconut flour banana bread with the perfect texture that is also grain, gluten, and dairy-free (Paleo)! This nut-free version of a favorite classic will become your go-to! Warning: make this and as the aroma fills your house, they'll come running, so make sure you get a slice for yourself. Freezes beautifully, and such a wonderful treat for those looking for nut-free banana bread that is refined sugar-free! 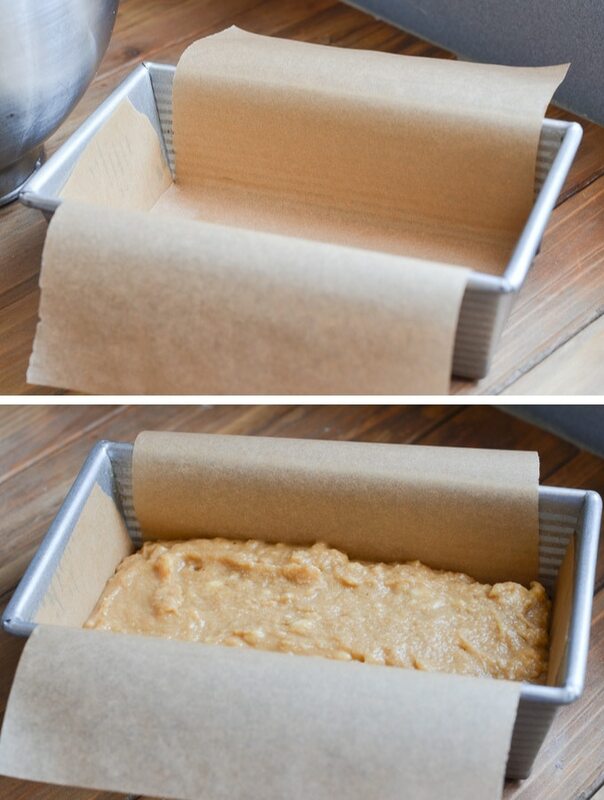 Preheat oven to 350 degrees F. Line a loaf pan with coconut oil and parchment paper or fully in parchment paper. Size parchment I cut: 7 x 14 top, and 3.5 x 14 bottom. Add coconut flour, tapioca starch, ground cinnamon, baking powder, sea salt to a small mixing bowl and whisk to combine until smooth and no lumps. 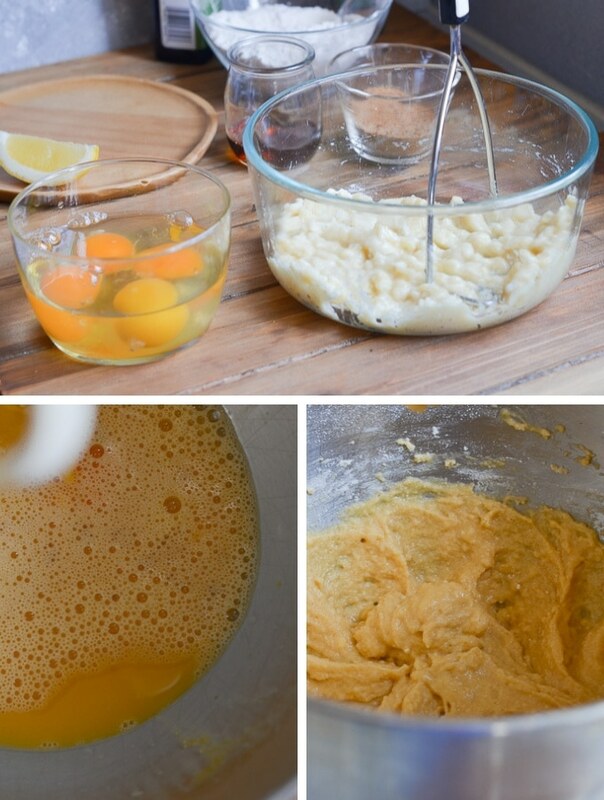 In an electric mixer, add the eggs, vanilla, maple syrup, coconut sugar, coconut oil and beat for about a minute. Add the coconut flour mixture to the mixer and beat for another minute until combined. Add the banana mash and mix for about 30 seconds until just combined. Let banana bread cool on cooling rack and slice when completely cool. Store for a few days in the refrigerator. Toss in a few tablespoons of dairy-free mini chocolate chips for an extra treat. How long does this banana bread last? It's best consumed the day you make it, however, store in the refrigerator for a day or two. Not only very tasty, but the texture is perfect. Similar banana breads of this type had some degree of “sponginess”. This one does not. Well done!